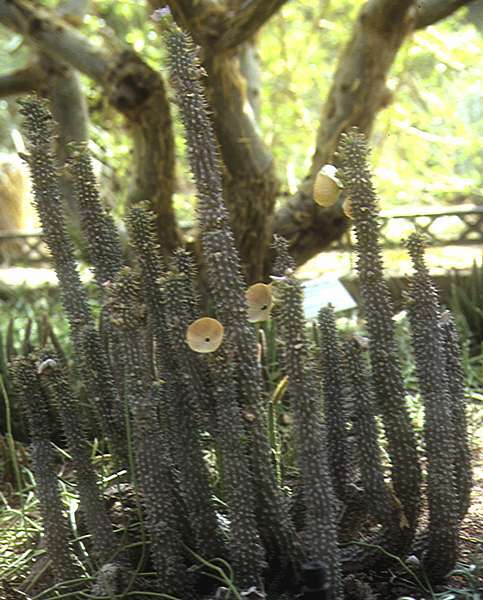 The genus Hoodia includes around 18 species of clumping spiny stem succulents. 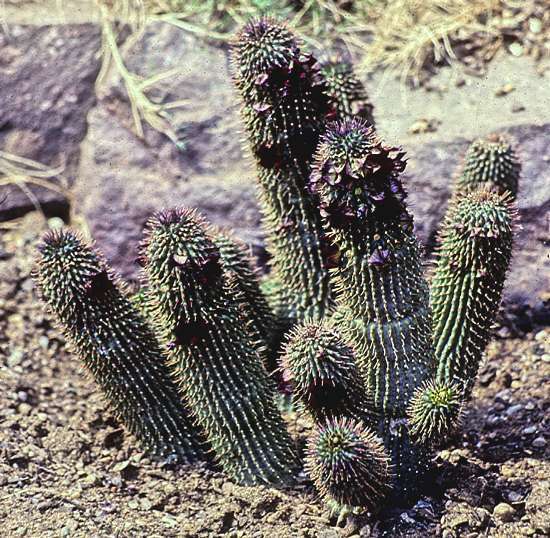 Despite their cactiform appearance, these plants are not cacti as often stated in the media. The erect green stems, up to 3ft tall in some species, carry many tubercles that merge into ribs. Each tubercle bears a single whiteish spine. The large disk-shaped flowers typical of this genus in red, purple or flesh colours are attractive at a distance, but produce an unpleasantly strong odour of decaying carrion to attract the flies that pollinate them. 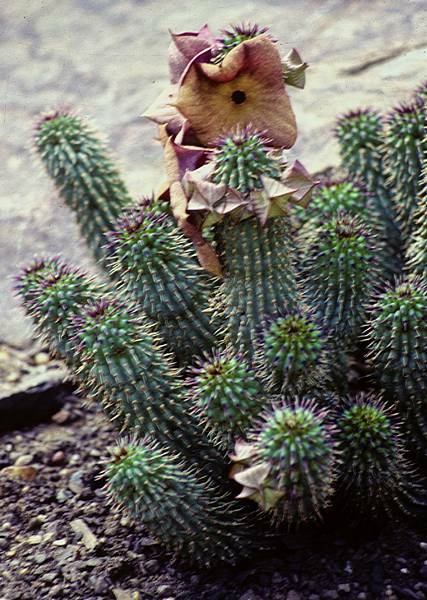 Some species have been moved into Hoodia from the obsolete genus Trichocaulon in which they were formerly included and these have smaller 5-lobed flowers. Native to arid parts of South Africa, Namibia and Angola. Hoodia gordonii contains a chemical structurally related to amphetamine that allegededly helps with appetite suppression and hence weight loss. The efficacy and safety of Hoodia remains controversial but that has not stopped herbal-supplement companies from marketing various Hoodiapreparations and over-collecting from depleting wild populations. Desert Botanical Garden, Phoenix Az. The erect thick green stems up to 3ft tall are covered with vertical rows of tubercles that merge into ribs. Each tubercle bears a single whiteish spine. Stems branch at their base to produce a clump. Foul-smelling disc-shaped flowers in shades of buff, orange or purple, are produced near the the top the the stems. The flowers have 5-fold symmetry with a small point in the middle of each lobe. Following pollination by flies, flowers are followed by a pair of 4- 5in long seed horns (follicles) filled with flat seeds each of which has a parachute at one end. Native to South Africa and Namibia. 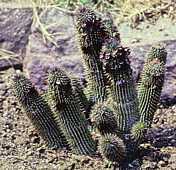 Despite its common name and cactiform appearance, Hoodia gordonii has no relationship to Family Cactaceae. Traditionally used by Kalahari bushmen to quench thirst and appetite on several-day hunting trips. Named for: Ernst Julius Rusch (1867 - 1957) German-Namibian farmer, plant collector. Erect grey-green stems up to about 20in tall are covered with vertical rows of tubercles, merging into ribs. Each tubercle has a sharp white spine. Five-lobed flowers near the top of the stems are dark red to dark purple. Native to the Eastern granite slopes of the Tiras Mountains, Namibia. is challenging as Hoodias are intolerant of excess water, humidity and low winter temperatures and are easily destroyed by moulds. Species coming from winter rainfall areas may grow during the Northern-hemisphere winter if kept warm or may collapse. A plant that has grown happily for several years can turn into a mush for no apparent reason. In a dry tropical climate, Hoodias can be grown outside and perhaps this is where they are best suited.